I often get asked, “What do you sketch with?”. 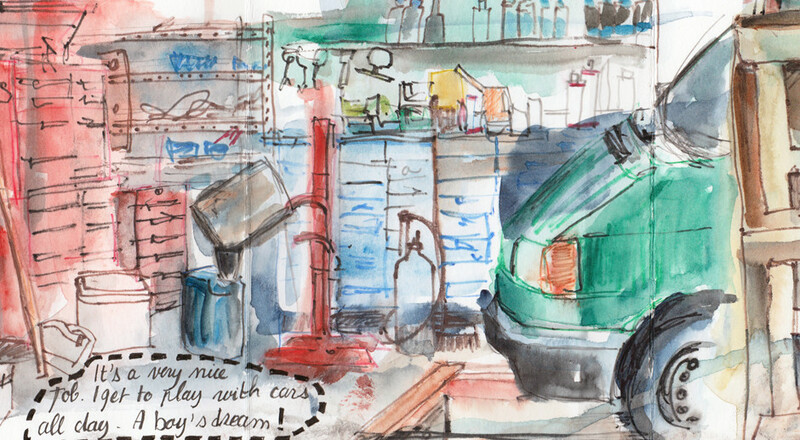 Urban sketching is drawing on location, capturing what we see from direct observation. My sketches tell a story and record a time and place. Drawings are usually quick and made while I am out and about, so my urban sketching tools need to be easy to set up and portable. Good quality sketchbook is nicer to work with – as I found out recently here – but anything will do. If you find expensive paper intimidating, buy cheap books you don’t feel intimidated using. You are better off with a cheap sketchbook full of drawings than looking at a beautiful, empty sketchbook. I like the Uniball eye pens and also use Staedtler pigment liners in 0.3 and 0.5. Sometimes I use a Pentel pocket brush pen to lay really dark areas. Now I don’t like all the colours in both palettes, so I’ll replace some with different alternatives as they run out. Some colours I like transparent (Cerulean Blue) other opaque (Cadmium yellow and red). Professional grade watercolours are worth buying, but they are expensive, so I try to use up colours I am not so keen on before replacing them with a better alternative. It gives me time to learn and find out which colours work best for me too. I use water brushes and travel brushes. You fill the handle of water brushes with water and squeeze it to release the water. They are great to travel light and they are part of my everyday urban sketching tools. For large washes, travel brushes and water are best. I take them when I am planning a specific sketching outing. Travel brushes are foldable brushes with a hollow handle that doubles up as a top to protect your brushes’ hair. I use Escoda Synthetic Kolinsky travel brushes. They are good quality affordable brushes. For water brushes, I like Pentel and Kuretake large brushes. Although they are not a necessary addition to my urban sketching tools, I also like to carry a few pencils. My favourite pencils are Inktense Derwent watercolour pencils. Inktense pencils look dull when you draw with them, but wet them with a water brush and they dissolve into beautiful vibrant washes. I find them useful to lay down colours on very quick sketches. I have a KOH-I-NOOR magic pencil that draws a multicoloured line and a mechanical pencil. Sometimes I use a white gel pen for highlights. 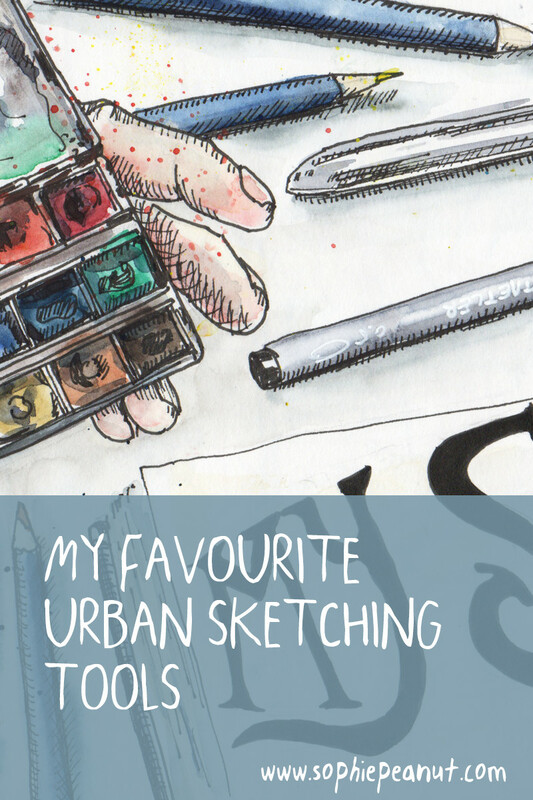 When it comes to my urban sketching tools, some folk are happy with a general answer (i.e. watercolour and pens). But most are expecting a very detailed answer. They want to know which brand of watercolour I am using and the name of the colours in my palette. They want to know what size and brand my brushes are. I always answer the question, of course. I am thankful for anyone that takes the time to look at my drawings and interact with me – but what I really want to tell them is that the tools I’m using don’t actually matter that much. As an artist, it’s how I’m using my drawing tools that matter. What matters is what I look at when I sketch, and what goes on in my head as my drawing progress. Advertisers tell us we can fix problems by buying stuff – so it is easy to think that if you buy specific art supplies, your sketches will look a certain way. I am not saying you shouldn’t experiment with new tools. It’s fun and important for your journey as an artist. But don’t spend too much time looking for the perfect tool. Beware of being caught in an art-buying frenzy. You can potentially accumulate piles of expensive art supplies you will never use. Art supplies will not make you paint beautifully. Practice, curiosity, patience, perseverance, and an open mind will! Constantly searching for the ‘RIGHT’ tool or sketching kit can be a form of procrastination. You will only get the results you want through practice and experimentation. Be wise and use your time to draw – not shop. P.S. You can find an edited version of this post on Uban Sketcher’s website What’s in my sketch kit? It doesn’t matter.